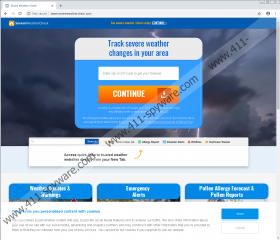 If you need to keep track of the weather forecast at all times, Severe Weather Check might be an extension you decide to install onto your Chrome or Firefox web browser. It certainly can be useful to see the temperature the moment you launch your browser, but that is, pretty much, where the benefits of the extension end. Yes, it can show you an accurate weather report because it records your IP address, and it knows your geographical location. The easy-access links to pollen.com, flunearyou.org, accuweather.com, and theweathernetwork.com websites work too, and you might find this service to be useful, but that is not how useful programs and extensions work. Whenever you install new add-ons or apps and whenever you decide to trust new services, you need to think if what they are offering you is useful and reliable. In this case, you are not offered a useful or reliable service, and it is our recommendation that you delete Severe Weather Check. If you need more information before you begin removal, keep reading. Did you download Severe Weather Check from its website (severeweathercheck.com) or the Chrome store (chrome.google.com/webstore/detail/severe-weather-check/heddedcjpankenbhoccbjdhkadmaagnn)? If that is the source of the PUP (potentially unwanted program), you might be on the safe side. On the other hand, if the PUP came in bundled with anything else, you need to inspect your operating system as quickly as possible. The last thing you want to deal with is clandestine and hidden malware. 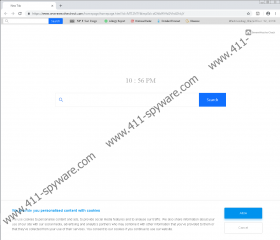 Use the Download link below to acquire a free and up-to-date malware scanner that will help you find out if there are any serious threats that must be deleted. If that is the case, forget about Severe Weather Check for the time being. After all, it is just a PUP, not a critically malicious Windows infection. On the other hand, it would be a mistake to underestimate suspicious extensions either. If you ignore the PUP and leave it be, tons of personal information and data regarding your virtual behavior could be sent to undisclosed third parties. Although it is pretty disturbing that an app that is supposed to help you check out the weather is recording and sharing information with unknown parties for, let’s be honest, unknown reasons, we are much more concerned about the search service. If you have used Severe Weather Check already, you must have noticed that all search keywords entered into its integrated search field redirect to search.yahoo.com. What is wrong with Yahoo Search? Most likely, nothing, unless a third-party decides to change the results shown, which is what happens when you interact with Severe Weather Check search tool. The results are modified, and since the company does allude to questionable partnerships with undisclosed parties, we have to consider the possibility that unreliable ads created by unreliable parties could be shown. Without a doubt, trusting them could be risky, and that is why it might be best to remove Severe Weather Check. A legitimate anti-malware program will inspect your operating system and delete Severe Weather Check together with PUPs and malware that might exist alongside this undesirable extension. You will not need to do a thing. Quick and efficient removal of existing threats is not the only reason to install this program. You also can benefit from the full-time security it can guarantee. Remember that if your system is not secured, it will be much easier for various undesirable programs to slither in and make a mess. All you need to do to prevent that from happening is to implement the right security tools. Of course, you do have a choice here, and you can remove Severe Weather Check manually. To make the process easier for you, we have created a guide that shows the steps that must be completed. Select the time range, check boxes, and click Clear data. Open Firefox and enter about:addons into the address bar. Tap keys Ctrl+Shift+Delete on the keyboard at the same time. Select the time range, check boxes, and click Clear Now.